For the Summer Olympics, there are 24 venues starting with the letter 'T', seven venues starting with the letter 'U', and 17 venues starting with the letter 'V'. 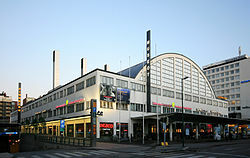 Helsinki's Tennis Palace in 2007. For the 1952 Summer Olympics, the Palace hosted the basketball competitions. Tokyo Metropolitan Gymnasium in 2008. The venue hosted gymnastics events for the 1964 Summer Olympics. The University of Georgia Coliseum in 2010. For the 1996 Summer Olympics in Atlanta, the venue hosted indoor volleyball and rhythmic gymnastic events. Toronto's Varsity Stadium in 2009. The venue hosted football preliminaries for the 1976 Summer Olympics in Montreal. ^ 1988 Summer Olympics official report. Archived 2008-11-18 at the Wayback Machine Volume 1. Part 1. pp. 200-1. Accessed 1 December 2010. ^ 1988 Summer Olympics official report. Volume 1. Part 2. p. 335. Accessed 2 December 2010. ^ a b c 1952 Summer Olympics official report. Archived 2008-04-11 at the Wayback Machine p. 52. Accessed 21 October 2010. ^ 1952 Summer Olympics official report. Archived 2008-04-11 at the Wayback Machine pp.62–3. Accessed 21 October 2010. ^ a b 1936 Summer Olympics official report. Volume 1. pp. 162-3. Accessed 17 October 2010. ^ 1992 Summer Olympics official report. Archived 2008-05-28 at the Wayback Machine Volume 2. pp. 246-9. Accessed 6 December 2010. ^ 1952 Summer Olympics official report. Archived 2008-04-11 at the Wayback Machine p. 57. Accessed 21 October 2010. ^ 2000 Summer Olympics official report. Archived 2000-11-09 at the Wayback Machine Volume 1. p. 391. Accessed 16 December 2010. ^ 1984 Summer Olympics official report. Archived 2010-11-02 at the Wayback Machine Volume 1. Part 1. pp. 102-4. Accessed 24 November 2010. ^ "Tianjin Olympic Center Stadium". Beijing Organizing Committee for the Games of the XXIX Olympiad. Archived from the original on 2008-08-10. Retrieved 2008-08-10. ^ 1984 Summer Olympics official report. Archived 2010-11-02 at the Wayback Machine Volume 1. Part 1. pp. 135-6. Accessed 24 November 2010. ^ a b c d 1964 Summer Olympics official report. Archived 2010-07-07 at the Wayback Machine Volume 1. Part 1. p. 115. Accessed 31 October 2010. ^ 1964 Summer Olympics official report. Archived 2010-07-07 at the Wayback Machine Volume 1. Part 1. pp. 130-1. Accessed 31 October 2010. ^ 1964 Summer Olympics official report. Archived 2010-07-07 at the Wayback Machine Volume 1. Part 1. pp. 138-9. Accessed 31 October 2010. ^ 1964 Summer Olympics official report. Archived 2010-07-07 at the Wayback Machine Volume 1. Part 1. pp. 120-1. Accessed 31 October 2010. ^ 1964 Summer Olympics official report. Archived 2010-07-07 at the Wayback Machine Volume 1. Part 1. p. 121. Accessed 31 October 2010. ^ 1988 Summer Olympics official report. Archived 2008-11-18 at the Wayback Machine Volume 1. Part 1. p. 206. Accessed 1 December 2010. ^ 1948 Summer Olympics official report. Archived 2011-07-16 at the Wayback Machine p. 50. Accessed 19 October 2010. ^ 1980 Summer Olympics official report. Archived 2008-11-18 at the Wayback Machine Volume 2. Part 1. pp. 104-10. Accessed 18 November 2010. ^ 1912 Summer Olympics official report. Archived 2008-04-10 at the Wayback Machine p. 221. Accessed 5 October 2010. ^ "Triathlon Venue". Beijing Organizing Committee for the Games of the XXIX Olympiad. Archived from the original on 2008-08-10. Retrieved 2008-08-10. ^ 1948 Summer Olympics official report. Archived 2011-07-16 at the Wayback Machine pp. 44-5. Accessed 19 October 2010. ^ 1956 Summer Olympics equestrian official report. p. 96. Accessed 25 October 2010. ^ 1960 Summer Olympics official report. Archived 2008-10-31 at the Wayback Machine Volume 1. pp. 66-7. Accessed 28 October 2010. ^ 1996 Summer Olympics official report. Archived 2008-05-28 at the Wayback Machine Volume 1. p. 544. Accessed 9 December 2010. ^ 1996 Summer Olympics official report. Archived 2007-09-27 at the Wayback Machine Volume 3. p. 457. Accessed 9 December 2010. ^ "Road Cycling Course". Beijing Organizing Committee for the Games of the XXIX Olympiad. Archived from the original on 2008-08-10. Retrieved 2008-08-10. ^ 1972 Summer Olympics official report. Archived 2011-09-19 at the Wayback Machine Volume 1. Part 1. p. 121. Accessed 8 November 2010. ^ 1972 Summer Olympics official report. Archived 2007-09-27 at the Wayback Machine Volume 3. p. 359. Accessed 8 November 2010. ^ 1908 Summer Olympics official report. Archived 2007-09-27 at the Wayback Machine p. 39. Accessed 5 October 2010. ^ 1976 Summer Olympics official report. Archived 2010-05-06 at the Wayback Machine Volume 2. pp. 226-9. Accessed 14 November 2010. ^ 1952 Summer Olympics official report. Archived 2008-04-11 at the Wayback Machine p. 50. Accessed 21 October 2010. ^ 1956 Summer Olympics official report. Archived 2008-09-12 at the Wayback Machine pp. 41-2. Accessed 25 October 2010. ^ 1992 Summer Olympics official report. Archived 2008-05-28 at the Wayback Machine Volume 2. pp. 234-8. Accessed 6 December 2010. ^ Sports-reference.com profile of Cycling at the 1920 Summer Olympics. ^ 1960 Summer Olympics official report. Archived 2008-10-31 at the Wayback Machine Volume 1. pp. 80-81. Accessed 28 October 2010. ^ 1960 Summer Olympics official report. Archived 2008-02-26 at the Wayback Machine Volume 2. Part 1. pp. 117-8. Accessed 28 October 2010. ^ a b c 1960 Summer Olympics official report. Archived 2008-10-31 at the Wayback Machine Volume 1. p. 84. Accessed 28 October 2010. ^ a b c 1960 Summer Olympics official report. Archived 2008-02-26 at the Wayback Machine Volume 2. Part 2. p. 319. Accessed 28 October 2010. ^ 1960 Summer Olympics official report. Archived 2008-10-31 at the Wayback Machine Volume 1. pp. 80, 84. Accessed 28 October 2010. ^ 1960 Summer Olympics official report. Archived 2008-02-26 at the Wayback Machine Volume 2. Part 2. pp. 118, 316. Accessed 28 October 2010. ^ 1932 Summer Olympics official report. Archived 2008-04-10 at the Wayback Machine p. 87. ^ 1972 Summer Olympics official report. Archived 2008-11-18 at the Wayback Machine Volume 2. Part 2. pp. 190-1. Accessed 8 November 2010. ^ 2004 Summer Olympics official report. Archived 2008-08-19 at the Wayback Machine Volume 2. pp. 299, 413. Accessed 24 December 2010. This page was last edited on 27 April 2018, at 13:12 (UTC).